I've been reading (or more accurately, listening to the audiobooks of) the Discworld novels by Terry Pratchett. Sometime in The Colour of Magic or The Light Fantastic or one of those early books, the librarian at the library of the wizard's university has an accident with a magical book and is turned into an orangutan. Being an orangutan turns out to be awesome, and apparently helps the librarian do his job. 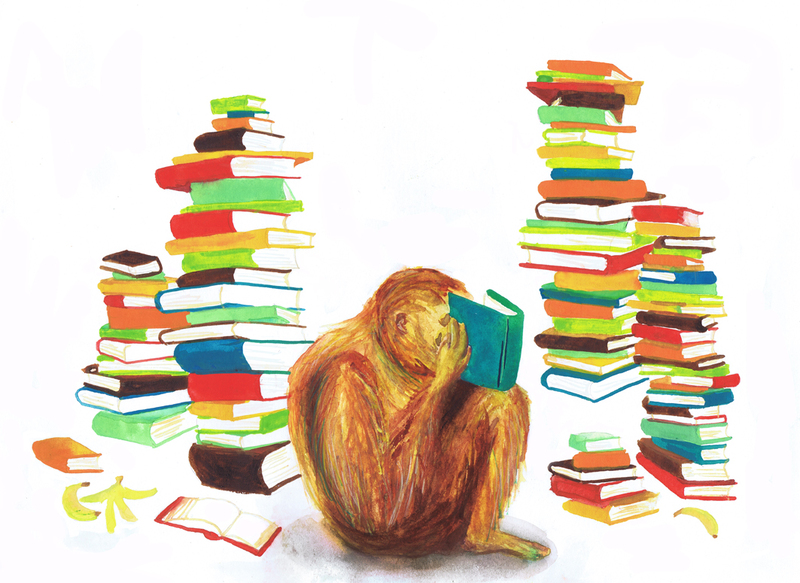 This is a drawing of him with his favorite books and a few bananas. In other words, librarian bliss! I like this because it works even if you haven't read any of the Discworld books. If you have read them, then you know that it's an important aspect of the library at Unseen University that books are powerful, dangerous, and have lives and minds of their own, and that the librarian is someone who respects that. So, this is a drawing with a white background, but with more than just one thing floating on it! However, I can't help think of how Chuck Close said, "If it comes out looking like art, it must look like somebody else's art," and it's true I was thinking a bit of this wonderful drawing while I was composing this portrait of the librarian. But it's a pretty different drawing than that one, and it was so much fun to make, and I like it more than most of my other work lately, so I call it a successful exercise. I really relate to the librarian lately. All I want to do is stay in and read. I've also started adjusting my work a lot more after scanning it. I used to just try to clean up any splotches or drips of paint, and then try to make the colors look as much like the original as possible. Lately, I've also been fixing a few errors (like in this one, places where the books overlapped wrong, or in my Mrs. Dalloway drawing, where the awning got really crooked) and altering the color in ways that the paint can't do. I use pretty heavy watercolor, balanced sometimes with lighter washes, but it can still get muddy or have a weird combination of intensity and lightness, so it helps to dodge and burn and so on. Speaking of which, I've simply got to give in and drop a couple hundred dollars on a really complete set of artist quality gouache paint. These solid blocks of color in the books were just begging to be painted in gouache. Yep, this thing is all watercolor! There's a tiny bit of white gouache mixed into some of the colors, and a bit more that I used to cover up sploshes on the original (but those were then painted over in Photoshop).